When we understand why this happens, we can take steps to change it, or make it easier to tolerate. Like too many questions in healthcare, the answer to why we are kept in the waiting room for so long is "follow the money." Doctors are paid by insurance and Medicare for every patient they see according to why they see the patient, and what procedures they perform for the patient, and (this is key) not by the amount of time they spend with the patient. Since their goal is to maximize their income, they will schedule as many patients into their day as possible. More patients plus more procedures equal more income. In any given day, they may not be sure what services they'll be performing for individual patients, and some patients require more time for their services than others. Equipment may break down. An obstetrician may be delivering a baby. There may even be emergencies. We lose our patience because we believe the time just has not been scheduled well. Understanding that it's the volume of patients and procedures, not the time spent per patient, that comprises a doctors' income, it's easier to understand why they get so far behind, and why we are kept waiting. What Is a Fair Amount of Time to Wait? An acceptable amount of time to wait will vary by doctor and the type of practice she runs. In general, the more specialized the doctor, the more patient you may need to be. The fewer doctors in any given specialty who practice in your geographical area, the more time you'll have to wait, too. If you visit an internist who consistently makes you wait an hour, that is too long. If you find a brain surgeon who makes you wait an hour, that may not be unusual. The fair wait time will also depend on the relationship you have with your doctor. If you have been a patient for many years, and the doctor usually sees you within a few minutes, but one day that stretches to a half-hour, then you know it's unusual. Try to be patient. Try to get the earliest appointment in the morning or the first appointment after lunch. 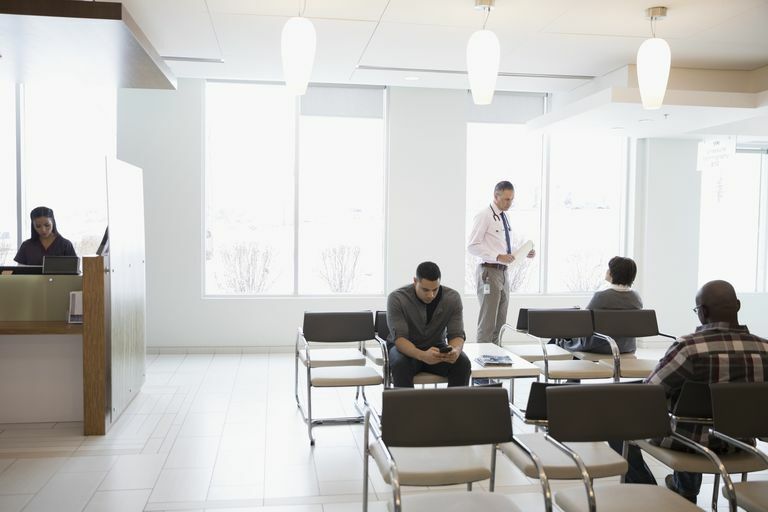 During each of those times, you'll avoid a backed up group of patients and you have a better chance of spending less time in the waiting room. When you make your appointment, ask which day of the week is the lightest scheduling day. Fewer patients on that day will hopefully mean shorter wait times. When you book your appointment, make sure the doctor won't just be returning from a vacation or conference, or a period of time out of the office. If the doctor sees children as patients, then try not to book your appointment on a school holiday. If possible, avoid Saturdays or evenings. Ask the person at the check-in desk how long she thinks you'll be waiting. Then decide whether you want to wait that long; whether or not seeing that doctor is worth that wait. If not, then reschedule. If you're told the wait will be 15 minutes, then speak up on minute 16. The squeaky wheel does get the grease. You don't have to be loud or demanding, but being firm and definite is fair. Politely ask what the hold up is, and how much longer you'll need to wait. Again, decide whether the wait time is acceptable. If the wait time you've experienced or you anticipate is unacceptable, then find a doctor that doesn't make patients wait so long. This is possible for a primary care doctor or a specialist you see on a regular basis for a long-term or chronic condition. A change in doctors may change your need to wait. This may not be possible for a sub-specialist or a doctor who is in great demand. Again, you'll have to decide if that particular doctor is worth the wait. You may have no choice. Your wait time will be less stressful if you are prepared to wait. Leave yourself plenty of time. Don't create more stress for yourself by scheduling something else right on the heels of your appointment. If the kids have to be picked up from school at 3, then schedule something that morning, not in the afternoon. If you have a 10 AM meeting, you may not want to schedule an appointment beforehand. Take a good book, your knitting, a hand-held video game — something to pass the time. Catch up on those letters you've been meaning to write. Expect the appointment in total, wait time included, to last far longer than you think it will. If it's shorter, then you'll be pleasantly surprised. But if you account for a long period of time, ahead of time, then it won't be so frustrating to wait.